A school teacher who had spent over 2 decades in the region, our fellow traveller, shared with us the travails of living in Maoist terrain- threats, intimidation, extortion, kidnappings, attacks and killings were all part of the game she explained. She also claimed that their presence had not improved the lives of the Tribal people and the only qualitative change was that the poor people got caught in the cross-fire between the Maoists and the Police and remained in a perpetual state of fear. She was also critical of the State repression in the name of tackling the Maoist menace. Throughout our drive from Damanjodi to Umerkote we found some traces of the situation she described- there were recurring Police outposts, heavy presence of personnel of the Odisha State Police, Central Reserve Police Force and the Indian Reserve Battalion, tell-tale marks of Maoist attacks on the Koraput Office of the Superintendent of Police in the Centre of the Koraput town that had been attacked years ago in broad day-light, and a palpable sense of unease that was all pervasive. The main protagonists of her story-the Maoists were invisible. People in road-side tea-shops claimed they were hiding in the Dandakaranya forests in neighbouring Chhattisgarh across the river and are visible only occasionally in the thick of the night looking for food, shelter, money or to take-to task people suspected of being Police-Informers. Nawarangpur in South Western Odisha was carved out of the erstwhile Koraput District and forms part of what is known as the Dandakaranya region. It is surrounded by the Districts of Koraput, Kalahandi, Malkangiri and Chhattisgarh’s Dantewada District. A four hour drive over roads with little trace of having been tarred brought us to the Umarkote Block, our place of stay for the night, by 7.30 PM. Early next morning we travelled a little over 20 kilometres to reach Jharigaon Block where the Party had been able to set up Office in a rented building. The steady flow of Adivasi men, women and children with red flags coming on foot, in tractors or pick-up vans was an inspiring sight. Soon thousands had assembled for the “Adhikar Rally” organised by the newly formed Nawarangpur District Organising Committee of the Communist Party of India (Marxist). It was all the more inspiring to note that this was an area with no presence of the CPI (Marxist) till 2 years ago and it is braving different kinds of threats and intimidation that the people came to be organised under the red flag. The Police had by then started questioning our right to hold a procession through the Block up to the venue of the Rally, although the mobilisation soon made them relent. Raising slogans demanding the right over Jal, Jungle and Jameen (Water, Forest and Land), against repression by Police, Forest Officials and Van Surakha Samitis, demanding Schools and recruiting School-Teachers, opening more Anganwadi Centres and Primary Health Centres with Doctors, seeking more Procurement Centres and remunerative prices for the Corn, control over usurious money-lenders and exploiting traders the thousands marched for over an hour to reach the venue of the Rally. The Meeting was addressed among others by Janardan Pati, CPI(M) Central Committee Member, Vijoo Krishnan, Joint Secretary, All India Kisan Sabha, Sala Marandi, Secretary, Adivasi Adhikar Rashtriya Manch, Jatin Mohanty, Odisha State President, Democratic Youth Federation of India, Rajesh Jani and Nuakhau local leaders of the Party. What is the reason for such a turn-around? It is necessary to know the ground reality and the struggles under taken by the Adivasi Adhikar Rashtriya Manch, All India Kisan Sabha and the Communist Party of India (Marxist) to understand the reason for the turn-around. Village after Village had almost a similar tale to tell, irrespective of whether they were Revenue Villages or Jungle Gaons (Forest Villages). In the Villages of Gaibandha and Dhokrikut in Chaklapadar Gram Panchayat of Jharigaon Block though they were Revenue Villages there were no roads, tube-wells or potable water supply as well as no electricity. In Telibhata and Nagjodi Villages in Umarkote Block which are designated as Jungle Gaons where over 100 families reside there is no sign of electricity, roads or water anywhere near their vicinity. Residents claimed that between July to October every year they were entirely confined to their homes as their Villages are cut-off from outside due to rains and absence of any roads. Although the BJD Government claims that they are providing 25 Kg rice at Rs.1/Kg through the Public Distribution System we found that in some Villages there were not even a single beneficiary and in most Villages the beneficiaries were only about 20 percent of the total population. The Central Government move to further curtail the beneficiaries in the context of this huge mass untouched by the National Food Security Act is a matter of serious concern. It was also reported that the Ration Dealers are informing people that from May onwards there will not be any distribution of food grains. The situation is further complicated by the fact that there is no implementation of the MGNREGA and distress migration is also witnessed in the District. While the basic amenities for a dignified life and opportunities for ensuring livelihood security are being systematically denied, the State has also shown total apathy towards Health and Education in the District. Schools catering to over 200 students studying from Class I to VIII with a single teacher, without benches, blackboards or toilet facilities, let alone mid-day meal are a common phenomenon across the District. Over 80 percent of the Schools have either 1 or 2 teachers or does not function at all. It is only in Panchayat Headquarters a slightly better situation was visible. Anganwadi Centres and Primary Health Centres are not present in the vicinity of the Villages and are rare and far flung. Primary Health Centres are more than 20 kilometres away from many of the Forest Villages. The people in Revenue Villages as well as Forest Villages and those cultivating occupied land are predominantly cultivating Maize. Vegetables, Sugarcane and Pulses also were found. However, the Government extension services are totally absent and the predatory agribusinesses as well as unscrupulous traders have been given a free reign. Hybrid Maize by Pioneer and Monsanto is being promoted even as seeds developed by Public Sector have been taken off the shelves. Traders give seeds and fertilisers at high interest rates and Farmers are forced to sell produce back to them as there are no Procurement Centres. Farmers reported that they are getting as low as Rs.700/Qtl in some seasons and a high of Rs.1000/Qtl at times although the Minimum Support Prices announced by the Central Government is Rs.1350/Qtl. Artificial shortages of fertilisers and seeds, jacking up prices on the pretext of shortages and black-marketing is rampant. No avenues for ensuring remunerative prices for Minor Forest Produce are open to the people. Indebtedness is another serious problem that is leading people in the region to destitution. The local people have a saying describing the unscrupulous moneylenders and their usurious interest rates which would roughly translate as: “I gave 10 and you took 10. That makes it 20. Then comes the interest.” The Adivasi Farmers reported that interest rates were well over 240 percent and often the papers misrepresent facts and show inflated amounts as their debt. There is no regulation of the Private Money Lenders and there is no effort to provide loans through Public Sector Banks. Even the money under the Tribal Sub Plan in Odisha is either underutilised or diverted for other purposes rather than for providing livelihood opportunities to the people. Despite cultivating land for generations and being in possession of Court documents almost 3 decades old not a single person had been given pattas under the Forest Rights Act either for their land or for their dwellings. Forest Officials and VSS are openly flouting the Forest Rights Act and are refusing to take the Gram Sabha route. There are repeated incidents of Forest Officials and Van Suraksha Samiti members forcibly evicting the Forest land cultivators, destruction of standing crops and plantations by the Tribal people. In Kapsabata Village in Burja Gram Panchayat of Umarkote Block the Van Suraksha Samiti members patronised by the ruling BJD destroyed standing crops in 40 Acres of land being cultivated for generations by the Adivasis. In Jandriguda a Forest Village, Nagara Dongri, Piplapadar and Loharaguda Villages in Badbarandi Gram Panchayat in Umarkote Block standing crop on over 1000 acres of land was destroyed and trees were planted by the Forest officials and VSS. This led to a spontaneous protest by the Kisan Sabha and Adivasi Adhikar Rashtriya Manch and the people confronted the Forest officials and VSS members being patronised by the Biju Janata Dal and other ruling class parties. Activists including Rajesh Jani were arrested and bail was denied to him. Police harassment and arrests by branding Adivasi Adhikar Manch activists as Maoists have been reported from Manipadar, Kadali Bhandar and Sahaj Bhandar villages in Patkhalia Gram Panchayat in Chandahandi Block of the District. We also received reports that there was arrest of activists a day after the Adhikar Rally on the pretext that they were encouraging Maoist activities. In the neighbouring Malkangiri District which is part of the much romanticised “Red Corridor” on the one hand threats from Maoists as well as kidnapping of our activists have taken place while on the other hand Party Comrades have been also arrested by Police on the charge of being Maoists. 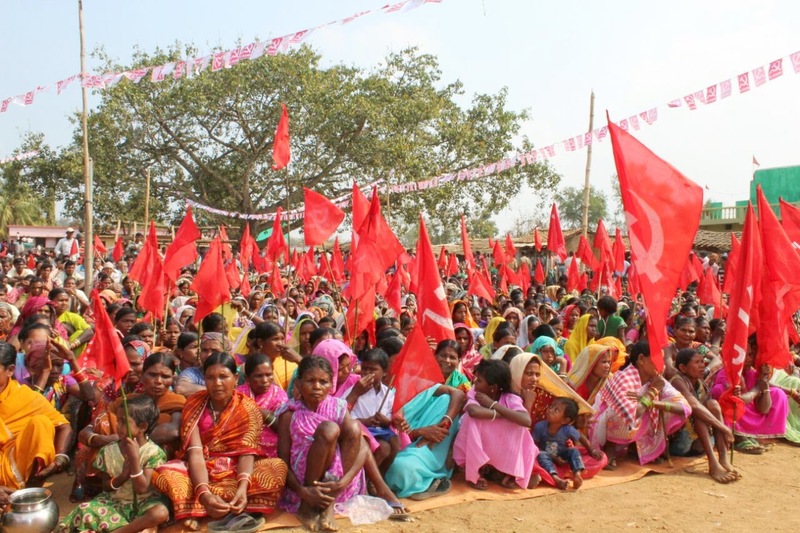 The Communist Party of India (Marxist), Odisha Krushak Sabha and the Adivasi Adhikar Rashtriya Manch have been intervening in the region for the last 3 years. It intervened in the case of arrests on false charges of being Maoists and against police atrocities as well as highhandedness of the Forest Officials. Hundreds of acres of land was occupied and cultivated under the leadership of the Party and the Krushak Sabha and Adivasi Adhikar Rashtriya Manch. In Jandriguda, Nagara Dongri, Piplapadar and Loharaguda Villages in Badbarandi Gram Panchayat in Umarkote Block over 1000 acres of land on which trees were planted by the Forest officials and VSS were reclaimed and cultivation was done. In Haathibari Village, Jharigaon GP over 400 acres which were being cultivated the Forest Officials and VSS planted trees. In an organised way this land has been reclaimed and the bountiful harvest which resulted from their toil was visible during our visit to these Villages. In Ichhapur Village, Chacha Gram Panchayat of Jharigaon 190 acres under us, Taliamba, Jharigaon Block 200 acres have been occupied and are being cultivated by the Adivasi people. The Forest Officials and VSS is repeatedly threatening the villagers and also in some places planting trees. The intervention of the Party against arrests by Police on false charges and successful action However, the confidence of an organised resistance movement has emboldened the villagers to protect their land despite all such efforts. Forest Rights Committees have been formed and applications have been filed for the land even as their right to cultivate it has been fiercely protected. Struggles for opening up more Procurement Centres, ensuring remunerative prices, ensuring loans at affordable rates of interest, regulating the Moneylenders and Traders have been going on. Due to our struggles 75 new Schools were sanctioned in the District last year with around 35 of them in the Jharigaon Block which is one of the worst in terms of educational infrastructure. Efforts are on to force the State and Local Administration to ensure regular teachers and other facilities in the Schools. Free Medical Camps extensively throughout the District is also planned in addition to mounting pressure on the Government to set up many more well equipped Primary Health Centres. It has been decided to spread the Krushak Sabha, Adivasi Adhikar Manch as well as the Student Federation of India across the District to take up issues in a more organised manner. Of the new recruits into the Party many are illiterate and separate efforts for a literacy campaign also will have to be undertaken. The first Party Class for nearly 100 members of the Party was held and efforts are on to consolidate and expand in the District. The 3000 strong mobilisation at the Adhikar Rally has given a big boost to the confidence of the people and they are resolute to continue forward the struggle for dignity with the red flag held in their hands. The struggle is a tortuous one and the solidarity of people elsewhere is required to ensure that these limited successes can lead to great victories for the oppressed people of the region.